Following two thrilling victories to start the 2017-2018 campaign, the Gators bring on the University of New Hampshire Wildcats from the America East Conference. They are led by long tenured head coach Bill Herrion, who has won coach of the year in that conference on four separate occasions. Entering his 13th season with the program, he is looking to improve on the solid 20-12 season they accomplished a year ago. Returning three senior starters in Tanner Leissner, Iba Camara, and Jordan Reed, they will have an opportunity to finish near the top of their league. Before they come to Gainesville, let’s take a look at what to expect from the Wildcats. The Wildcats opened their season with a decisive 95-39 victory over Division III Wheelock College, and then quickly ratcheted up the competition level with a game against Texas. With stud Longhorn freshman Mo Bamba out with a concussion they were able to keep the game mostly competitive, losing 78-60. New Hampshire is going to bring a pace very different then what Florida saw in their first two games. Gardner-Webb and North Florida liked to play extremely fast, and New Hampshire will contrast that by playing slowly and methodically. They rank 273rd nationally in adjusted tempo, and have the 318th slowest average possession time at 18.9 seconds. 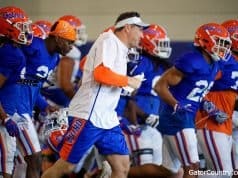 Playing a speed contrasting the first couple games of the season will be a great way to see how the Gators, especially the newcomers, can adjust. Reading the floor like a chessboard, New Hampshire is looking to get deep into their offensive sets and make the best possible read. Usually, that means looking for a 3-point look. Nearly half of their field goal attempts (48.3%) are three pointers (29th nationally), but they have only converted them at only 27.6% to start the year. These shots from deep come very differently then they do from most teams, as New Hampshire really likes to play out of the post and get kick outs. Putting pressure on interior defenders and demanding help to come, they look to hit the open man for a clean look. They also love to give their big men a chance to work for their own shot, as 18.8% of their possessions end in a post-up shot attempt. They score on 48% of these looks and draw fouls on 15.2% of them, so containing these post isolations will be big. No team has made a concentrated effort to attack the Gators like this, so Kevarrius Hayes, Gorjok Gak, Keith Stone, and the other frontcourt players will have to play strong and intelligent to not allow an easy baby hook or give up a foul. The Gators did not defend post-ups well last year, and this will be a great opportunity to learn and improve. Whereas pick and rolls are a big part of college basketball these days, the Wildcats don’t utilize this strategy very often (only 13% of the time) so all around the Gators will see a different offense on Sunday. New Hampshire plays man defense almost all the time, and they primarily try to run teams off the 3-point line. They’ve done a pretty good job of limiting opposing team’s long ball effectiveness only giving up 29.2% from three, so we’ll see what they have in store against the onslaught of threes the Gators will be putting up after two consecutive hot shooting games. You also know the Gators are going to try to run on them, and New Hampshire has done pretty well limiting transition buckets by only allowing a 41.7 field goal percentage on those usually highly effective shots. Where New Hampshire can struggle is containing the ball on screen and roll plays, as well as isolation plays. When running screen and roll against the Wildcats, the ball handler has been able to convert on 50% of their attempts. Chris Chiozza and Michael Okauru should get plenty of opportunities to use on-ball screens in this one to initiate offense. Isolation scorers have been able to convert on 42.9% of their attempts will getting fouled 11.1% of the time, so look for KeVaughn Allen and Jalen Hudson to be aggressive when they catch the ball on the wing and square up. This honor has to go to senior big man Tanner Leissner. Standing 6’7” and weighing 230 pounds, he is the guy most looked to for points and for interior presence. The returning first team all-conference player in the America East is averaging 18 points, 10 rebounds, and 1 block in this early college basketball season and he’ll look to continue to be a double-double threat all year long. He does most of his work on post isolations, an art we don’t see as much as we used to in college basketball. 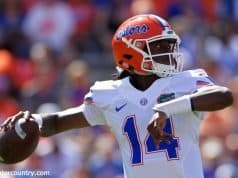 Not allowing him to catch the ball where he wants to and go one on one, as well as limiting his passing out to open shooters will be the key to locking him down for the Gators. With the struggles the Gators had least season guarding post players one on one, they’ll need to show here they can defend the paint against mid-major competition. 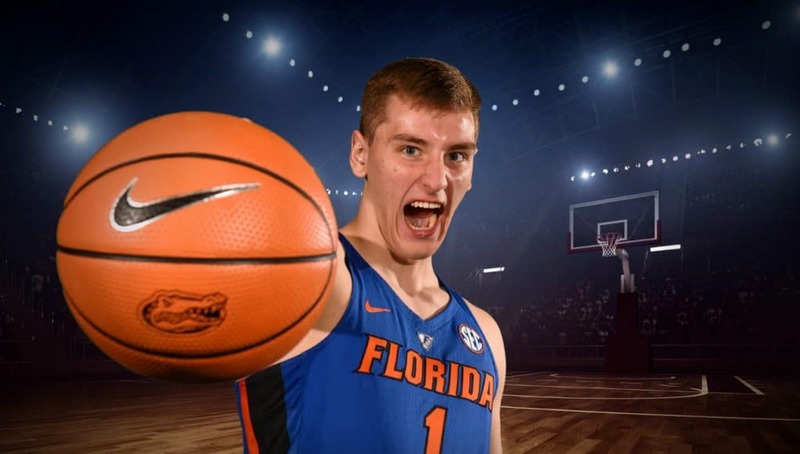 Tanner Leissner and Iba Camara are good players, but if the Gators can’t limit their production on Sunday they will have a whale of a time defending SEC talent like Tyler Davis and Yante Maten. As I mentioned before, Kevarrius Hayes, Gorjok Gak, Keith Stone, and Dontay Bassett should have a role in defending these looks, so I’m looking forward to seeing how they compete down low. Offensively, I’m hoping the Gators attack New Hampshire’s struggling pick and roll defense, so Chris Chiozza should be important for the Gators in orchestrating and executing these sets. Getting Michael Okauru some opportunities to run screen and role would be great for his development, so I hope he’ll get this chance as well. Will the Gators keep up the offensive tear they’ve started this season on? 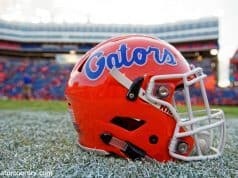 Leave a comment here or post on the Gator Country forums.